Meet the Dog Box that says "CLASS"
DIAMOND DELUXE is the premier brand of aluminum dog boxes, dog crates, dog hauling trailers, truck bed covers and custom built units for animal transportation. DIAMOND DELUXE units are constructed of 100% aluminum. Not only are DIAMOND DELUXE dog boxes attractive with their tread brite exterior, but they are also lightweight and will never rust or rot like other brands of dog box. 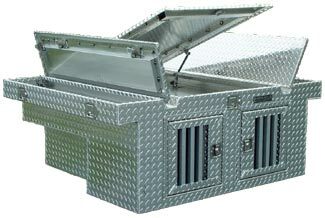 Most all of DIAMOND DELUXE dog boxes are lightweight enough to be loaded and unloaded by one person with ease. Corrugated plastic insulation on all of the exterior walls in the dog compartments. Thank you for not only visiting our site, but also considering our products. Thank You for Your Business and GOD BLESS!